Planning your summer? Check out our weekly camp calendar for June, July and August 2018! We will be offering 4 weeks of AcadeCoders (Game Development) and of 4 weeks AcadeMakers (Maker Movement). Registration forms can be downloaded in PDF or Word formats. Scroll down to see all weekly topic descriptions. 1 Jun 25-29 Maker Movement Let’s Make a Raspberry Pi Synthesizer! 2 Jul 3-6 (4 days) Game Development Let’s design a game using the new Godot 3.0 engine! 4 Jul 16-20 Maker Movement Let’s Make a Toy Set for a Playable Tabletop Game! 7 Aug 7-10 (4 days) Maker Movement Let’s Make a Wizarding Wand … or many! 8 Aug 13-17 Maker Movement Let’s Make a Comic Book … or many! During this week-long project, AcadeMakers campers focus on music and create an electronic instrument out of a raspberry pi computer. They accept electrical signals from a power source and then modulate them through mathematical functions and oscillators to produce a resulting sound wave. They also hook this up to a “Rhythm Machine”, a small patterning piece of code that allows for drum machine type stepping, which help them keep a whole song in order, all in one little box! To keep the level of noise to a minimum, AcadeMakers Campers require their own headphones; earbuds being fine. During the year at AcadeCap, students have developed a school-wide game known as “AcadeBattles”. This is a tabletop game similar to a game like Warhammer. The core concept is designing a “Squad” which is a 5-10 character team that can face off against other “Squads”. In certain modes, it can even be played 2v2! During this summer session, Maker Movement Campers think up a fantasy/sci-fi game theme such as mummies, ninjas, dragons, aliens, or whatever the imagination rolls out. AcadeMakers Campers learn to assign fair statistics that do not overpower other existing or new players. The aim is to end up with a balanced team. This session explores concepts such as Game Design, Randomness, Spatial Sensing and Graphic Design. This summer session is open to a wide range of AcadeMakers campers to design and fabricate a Wizarding Wand. The AcadeMakers campers end the week with a custom-made Wizarding Wand, which they find on a nature walk, pick and fashion themselves. Basic woodworking skills are taught. The week is themed like the most famous Wizard’s School, to include games like Quidditch and Wizard’s Duels, as well as week-long competitions such as the House Cup. Campers acquire board game strategies playing Harry Potter Monopoly, Clue, Hogwarts’s Battle, and more. Harry Potter modded Minecraft is part of the downtime between themed events. Do you have story ideas? Do you like to draw? Using Krita, an open-source drawing program, AcadeMakers Campers have the opportunity to improve their art and to fit it into comic strips as they go! Over the course of the week, they have drawing sessions and creative exercises to ignite the imagination. The campers start with a blank page and begin to sketch. The sketch is digitized, traced and coloured, and is saved as a panel. After completing 4 to 6 panels, Campers have enough art to fill a page. At the end of the week, campers publish a printed staple bound comic book. This session takes a look at Studio Ghibli and the graphic novels and animation of Hayao Miyazaki et al. NOTE: AcadeCoders Game Development will be available in 5 different streams. Campers can choose the same stream for all succeeding weeks in order to further develop a chosen project, or choose a different stream for each Game Development week. Campers must indicate which stream they will be participating in during registration. AcadeCoders campers attending this stream want to learn about most everything in the game development world; how objects move, how a player, enemies and worlds are created, all in one. This is an all-rounder learning stream; therefore, the mechanics are kept simple. For example, campers make a 2D TOP DOWN adventure game similar to “The Adventures of Zelda: A Link to the Past” for the Super Nintendo. 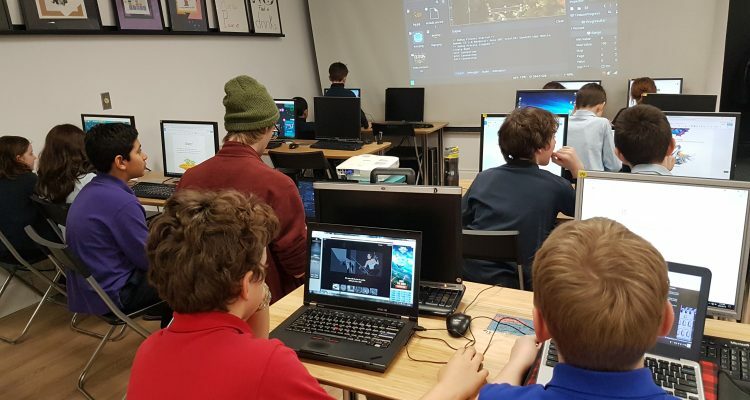 In this stream, the AcadeCoders Campers gain well-balanced, all-around, knowledge to explore game development on their own. Warrior AcadeCoders campers charge into battle and defeat the enemy! In this stream, campers cover a more action-based game similar to the first “Castlevania” for the NES. The game is meant to be simple, the main character versus an evil lair. Campers joining this stream must have the ability to channel their maker minds to create a world worth defeating. This stream is similar to the Adventurer stream but factors in real-time 2D physics as well as custom written physics. AcadeCoders campers develop a solid understanding on spatial reasoning. The Storyteller game development stream will have no combat elements. It will focus on telling a story and solving puzzles created by the AcadeCoders campers themselves. This stream also allows for a stronger focus on storytelling while other streams work on the enemies and the worlds. Campers may use either code base, the top down or the sidescroller, strictly focusing on puzzle solving through moving physics objects or using simple abilities. Sign up with a friend or more as a team! The Clan Member stream will let some of the campers learn aspects of programming while others focus on other strengths such as art, music and design. A group of campers with varying interests and skills will make a great team to design and develop a more complex game than possible by one single camper. Campers may want to join as a group and figure out along the way what are their interests and skills! Campers will learn important team skills that will be an asset in the work force. Become a True Spatial Magician by joining this stream where AcadeCoders will dive into Matrix math for game development. This stream enable campers to make a 3D game, under stringent circumstances: they must be willing to put in extra focus and time to achieve the end goal. This stream will be demanding and challenging and if the campers are up to it, they will have developed and acquired the skills to create their own 3D game on their own as well. AcadeCoders Campers will learn the coded physics and the basic 3D modelling because game development requires practice. Additional challenges will be provided each week. This stream is as close as can be to a university preparation stream for future game programmers as it incorporates Matrix math. No Comments on "AcadeCoders & AcadeMakers 2018"